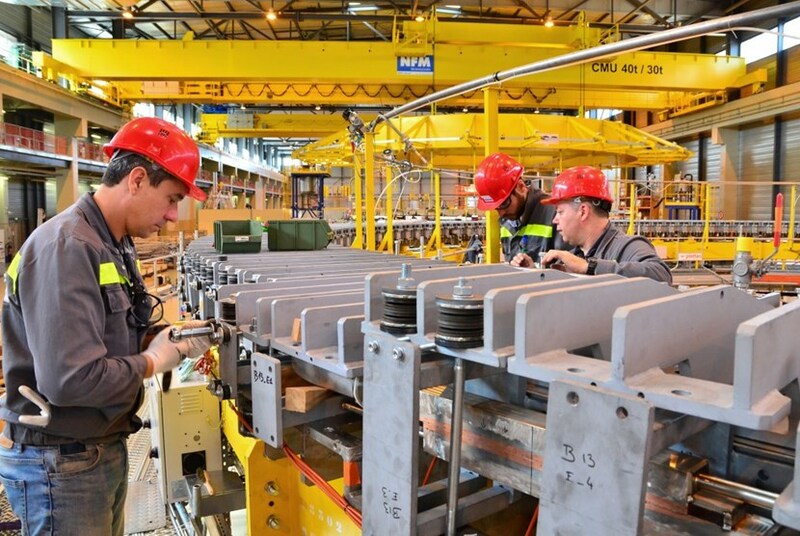 It has been almost one year since the fabrication of the first ring coil was launched in the on-site Poloidal Field Coil Winding Facility by European Domestic Agency contractors. 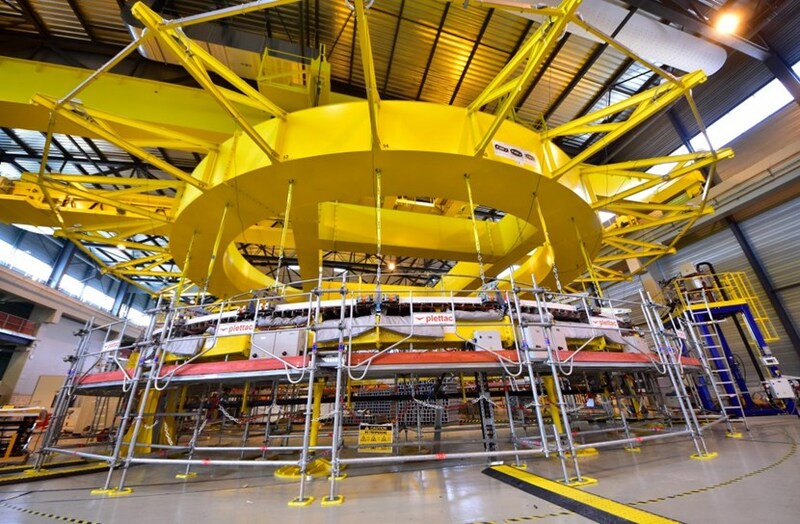 Out of the eight "double pancake" conductor windings needed to finalize the 350-tonne magnet, three have been wound and are ready to pass through the resin-impregnation phase—an operation that contributes to both electrical insulation and structural strength. Attached to the circular spreader beam, one of three finalized double pancakes (out of eight needed to complete the winding pack for PF5) is being prepared for impregnation operations. On one of the circular platforms on the southern end of the silent, clean and temperature-controlled facility, a double pancake sits, still attached by 24 lifting points to the circular spreader beam that has just moved it from the stacking station. A few metres away, technicians are busy assembling the vacuum containment vessel—the "mould"—that will enclose the double pancakes throughout the lengthy and delicate resin impregnation process. 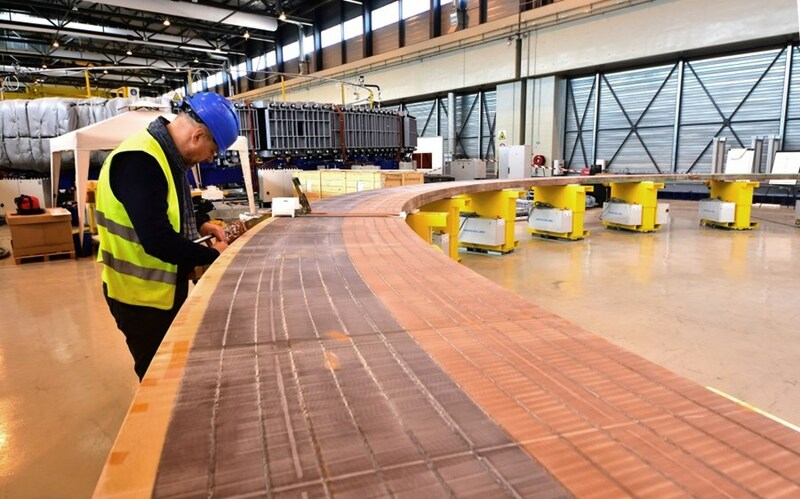 "During impregnation, we inject some 600 litres of epoxy resin at a temperature of 55-60 °C through entry ports in the mould," explains Gian Battista Fachin of the European Domestic Agency, who works in the facility where Europe is fabricating the four largest ITER poloidal field coils. "At that temperature the resin is as liquid as water and easily penetrates through the fiberglass wrapping of the double pancake." Once extra pressure has been applied inside the leak-tight mould to insure that all micro spaces are properly filled, the resin's temperature is ramped up first to 100 °C for a few hours of "gelling," then to 140 °C for a full day and a half of "curing." By then, the resin has become rock solid and the shining white double pancake has turned into a massive block the colour of caramel. The resin impregnation process was tested and validated on a "dummy" conductor winding that is presently stored at the far end of the building. "We learned a lot from the dummy, right from the beginning operations that began in November 2015," confirms Gian. "We established metrics and procedures, refined bending parameters, impregnation and injection durations ... everything a dummy is for." The dummy is a perfect replica of an actual double pancake for the 17-metre-in-diameter poloidal field coil #5 (PF5). For reasons of cost however, it is wound from copper conductor rather than from superconducting niobium-titanium alloy. Technicians are busy assembling the vacuum containment vessel—the ''mould''—that will enclose the double pancakes throughout the lengthy and delicate resin impregnation process. When all eight double pancakes for PF5 are finalized (winding is underway on the fourth in the series now) they will be stacked to form a winding pack—the coil's very core—which will be wrapped with insulating fiberglass tape and impregnated with resin as one single component. The winding pack will then receive additional equipment such as clamps, protection covers and pipes. At that point, one last crucial operation remains to be performed before the component can be considered fit for duty. When ITER enters operation, liquid helium circulating inside the conductor will bring the coil temperature down to 4 K (minus 269 °C) to create the physical conditions for superconductivity in the niobium-titanium conductor. Throughout the manufacturing process, sample tests and quality control have insured that the conductor's performance in such extreme conditions is in line with the magnet system's requirements. What remains to be tested however, is the coil's behaviour as a whole. How is it affected by the thermal contractions generated by the ultra-cold temperature? Does the liquid helium circuit within the cable-in-conduit conductor remain leak-tight? Can cracks develop in the resin and hinder electrical insulation? Resin-impregnation procedures were tested on this double pancake ''dummy''—a perfect replica of the conductor, only made of copper instead of the superconducting niobium-titanium alloy. These questions can be answered without having to cool the coil all the way down to 4 K. At the temperature of liquid nitrogen (80 K or minus 193 °C) thermal contractions have already reached their maximum and all the potential issues can be identified. Also, cooling with liquid nitrogen is much cheaper and easier to implement than cooling with liquid helium. In May, the cold testing equipment will arrive from Italy for installation in the northern end of the workshop. The four coils manufactured on site (ranging from 17 to 24 metres in diameter) will be tested one after the other in the cold testing vacuum vessel, as will a smaller coil (10 metres in diameter) that is being manufactured in China under an agreement with Europe. Cold-testing operations are scheduled to begin in the summer of 2019 and last for more than one year.